This 100% silk scarf is loaded with vibrant color. It measures 34 inches square, for lots of styling options! This one is mostly royal blue with varying other shades of blue, along with light and dark pink. The earrings hang 3" from the finding loop. They start with a beautiful twisted, light-pink glass rectangle surrounded by dark pink bicone crystals. 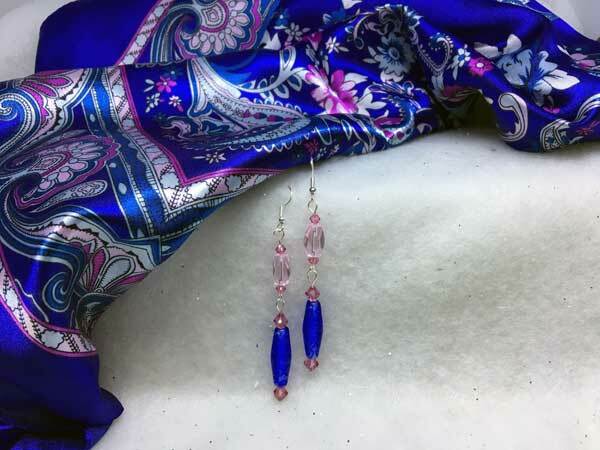 Hanging separately from this is a royal blue glass tube surrounded by larger, dark pink bicone crystals.